While everyone talks about the next generation tablets, only few understand how these differ in terms of their specifications when it comes to comparative advantage of one over the other. Different competitors are trying to take over the revenue market share as well as the market share for potential consumers. In this June when Google announced its Nexus 7, the rumors were that it is going to take the top place in the tablet market given its excellent features and will give tough time to its competitors including iPad and kindle. However, this did not come very true. Kindle still is at the top as it has the mix of features of iPad and Nexus put together in the small package. The good thing is that it not only comes in small package but also has a variety of accessories as well. For example the famous kindle covers coming with the kindle package are excellent for the little good angel’s protection. Apparently, all the companies want to make their presence felt in the 7 inches tablet market. However, with iPad mini coming to the market, it is very different form the above concept. 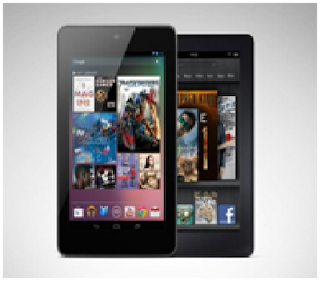 Kindle and Nexus are coming out with wider screens and the iPad mini as the name indicates has a low width screen with the same features to compete in the same market. Amazon started the tablet fight and it is not going to give up on it easily. For your reference, the new Kindle Fire 2 is rumored to be coming into the market this year in the last quarter as well. Supposedly, if Kindle fire 2 is of the same size as the Nexus is, both will have a fight until death for the best share of the market. As we have already seen that Kindle is not only capable of having an ease in compatibility with all Amazon as well as iTunes apps and games, I do not have any doubts that it will have any issues with compatibility for the Google Inc products too. The Nexus 7 has an LCD display that runs with a resolution of 1280 X 800 pixels. It also has the tendency to translate pixels to a density of 216 PPI. This feature is as good as it can be in such a little price for the Nexus in comparison to the other tablets in the market. While Amazon has not at all announced the actual news, but the rumors form the different news sources are that Amazon will be releasing four tablet designs with the Kindle name in the Fire sub brand category. They will have features of two unique and different displays. The pixel sizes would be 1024 X 600 and 1280 X 800. Both the devices from Google and Amazon will have the Android based OS. The jellybeans upgrade will be available for the ice cream sandwich OS for Nexus, however, Amazon is working on bringing the all-new heavier OS in the Android category, very different from any Android based Os in any other device. Let us hope that the consumers do not suffer for the initiation by both the market competitors and can be satisfied for their needs rather the devices quenching the thirst for competition for both the fighters. Najeen wrote her first article when she was the age of 13. She realized she could go on with writing for technical stuff being her expertise later on. She is now a professional writer, writing regularly for consumer products. Her expertise resides in the category of gadgets and the news about the technological advancements.